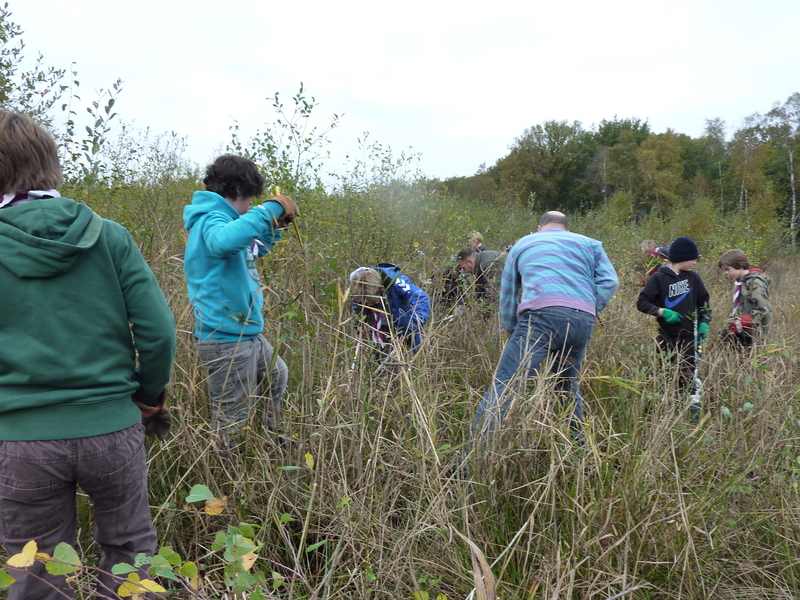 Fleet Pond regular volunteers were joined by reinforcements, as we resumed our campaign to drive out the invasive scrub taking over Coldstream Marsh and to create a thriving, open marshland. 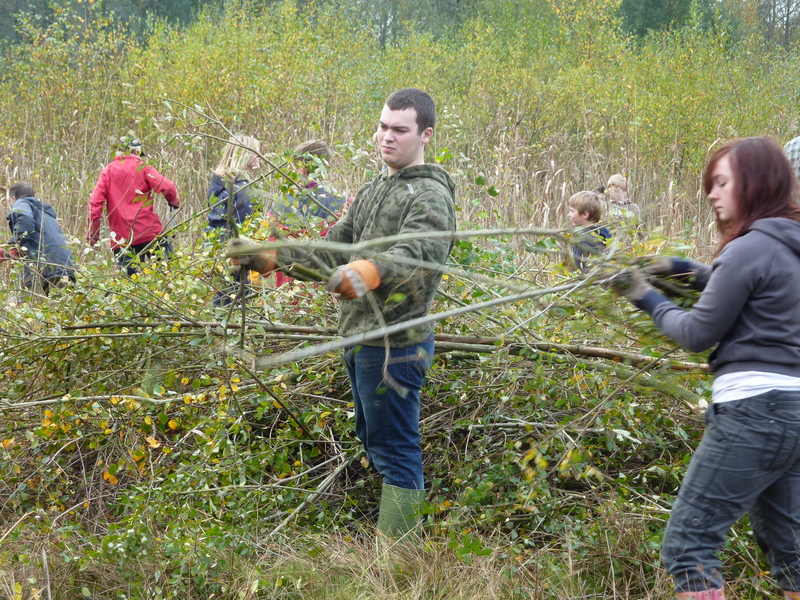 Last month the volunteers managed to advance as far as the tree line, and with the help of scouts from 29th Odiham, Fleet Cubs and RSPB Young Wildlife Explorers, we hoped our nearly sixty-strong team would progress as far as the margins of the pond. The terrain was pretty rough and it’s hard work wading through marshy water to get to the large clumps of alder, willow and birch sprouting out of the boggy depths. It’s even tougher, lurching, slopping and occasionally slipping, as you drag the chopped wood back to the fire. After a murky start, the sun was shining by the time we stopped for tea. It was good moment to pause and admire the beautiful Autumn colours around the pond (until the wind changed direction and smoke from the fire brought tears to my eyes). We covered a fair amount of terrain, although we didn’t quite make it as far as the pond. Hopefully, cattle will be able to graze the area next year, to keep re-growth at bay. As I sat down on a tree stump, to pour the water from my wellies and check no small, aquatic creatures had taken up residence in between my toes, it was satisfying to view the difference we had made to the landscape. 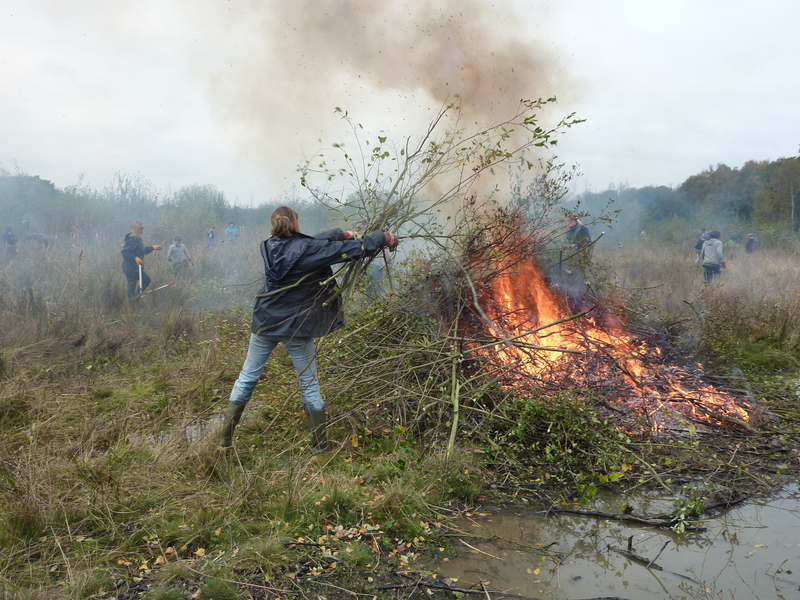 If you like reeking of bonfires, peeling off wet socks, and finding odd bits of plant and ash in your hair – join us for more fun in the marshes next month! Hart District Council Countryside Services have dramatically restored areas of Fleet Pond. With the aid of a Higher Level Stewardship (HLS) grant, Fugelmere Marsh has been reclaimed from the encroaching scrub and trees. While walking around the pond you may have seen a lot of work going on in Fugelmere Marsh and lots of logs in the main car park. The marsh area had become encroached by trees and scrub, these were cut down, and the timber is going to be sold locally as firewood. Although the cleared area looks quite barren now, this allows water and light to penetrate the ground, marshland plant seeds are lying dormant under the soil in the seed bank waiting for spring. Reedbeds are a successive habitat, if left unmanaged the habitat is lost due to the encroachment of trees and scrub from the surrounding woodland, these create shade as well as drawing up the water from the wetland. The scrub and trees were cut down and removed, then the ground was mulched and scraped to help stop the trees growing back. Livestock are going to be grazing Fugelmere marsh as of next year. Hart District Council installed a new grazing enclosure around Fugelmere Marsh. The fence is similar to that of Wood Lane Heath and Coldstream Marsh. The livestock will graze any regrowth from the scrub coming back, ensuring the marshland stays as an open habitat. Grazing maintains a mosaic of vegetation that is important for a wide range of wetland species. Hart District Council have also created 3 new scrapes in Fugelmere Marsh. Creating scrapes is important in the restoration of marshland habitats, as digging down into the soil brings the seed bank to the surface. The edges of the scrapes are then graded which provides a great feeding surface for wading birds. The scrapes have deeper areas so will hopefully retain water for most of the year providing a perfect habitat for amphibians, dragonflies and other pond life. The value of scrapes is perfectly shown in Fleet Pond’s recently restored Coldstream Marsh, which after being created has had many exciting and rare species turn up, such as the creeping fen pillwort which is a red data book species until now not seen at Fleet Pond since 1964. These are exciting times ahead, everyone is poised in anticipation, what species will turn up in the newly restored habitat in Fleet Pond? The above is a Press Release from Hart District Council. We’d be very keen to see you! To get a flavour, see here and here for recent events. 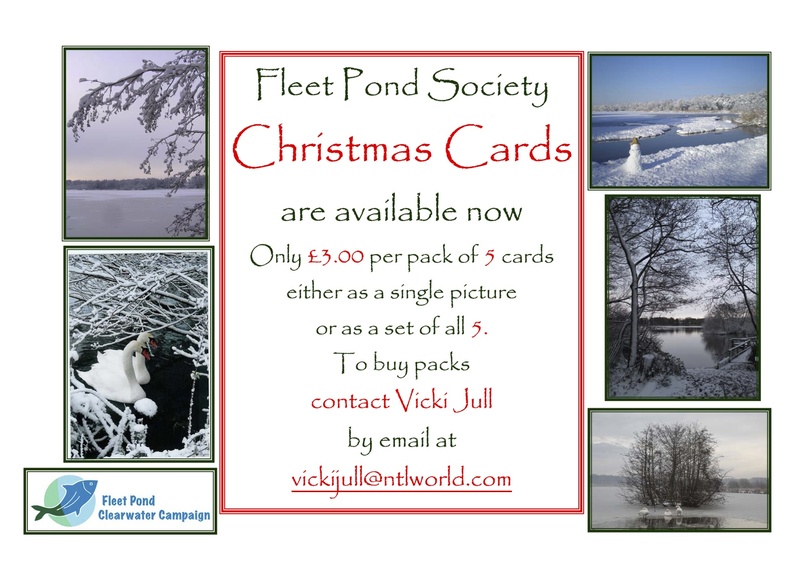 You are currently browsing the Fleet Pond Blog blog archives for November, 2011.